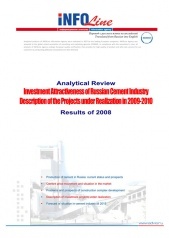 About the Analytical Review Investment Attractiveness of Russian Cement Industry. Russian cement market in the 2nd half of 2008 fell into the state of severe crisis after a period of rapid increase in prices and investment activity in 2006-2007 and the 1st half of 2008. As a result of this, prices of cement reduced by more than 40%, the share of import cement in Russian market exceeded 12%, and the demand reduced by more than 20%. It is extremely important under such conditions to get relevant news, statistics and analytical information about the state of cement market and industries-consumers. Informational and analytical products of INFOLine Information Agency (IA) about the markets of cement and other construction materials, and construction market, are aimed at solution of the said problems.